With the introduction of value-added tax or VAT in UAE that will soon take effect on 1 January 2018, companies are instructed to be registered and prepared as soon as possible for they can be subject to penalties if they do not do so. Registering can be done with the help of our team that will guide you through the step-by-step process that the VAT registration requires. On the other hand, the preparation for VAT in UAE can be attained by enrolling yourself in one of the VAT courses in Dubai. Our company, Farhat & Co., offers VAT training in Dubai and in all parts of the UAE. Requirement: The minimum fee is AED 10,000 if the number of trainees is less than 5. Why Should You Attend the VAT Training in Dubai? 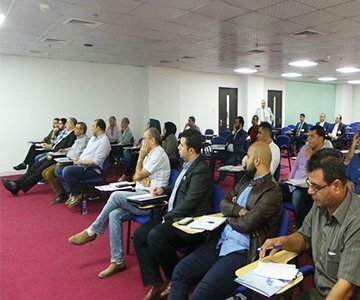 This VAT training is greatly beneficial for any company as it will discuss all about VAT that most people do not understand because this is a new concept in the UAE. With this training, the accounting staff of companies will be having an upgrade in fully understanding what VAT is all about and how to properly account for it. Everything will be tackled from the correct and accepted way of invoicing to recording entries. We have devised the answers to your questions and the explanation of what the exact impact of VAT is to our country. The preparation of VAT return forms will also be discussed, and this VAT training shall cover the various types of goods and services and the accounting treatment of VAT for those. Our VAT training in Dubai has been designed for people who are new to VAT. This is for people who make big decisions for their companies that have consequences, which involve VAT. Who Should Attend the VAT Training in Dubai? Why do I need VAT training? Who will conduct the VAT training? What other things should I do after the training? What is the obligation of a business when it comes to VAT? VAT is a new concept not just for the business people in the UAE but for everyone here. Ever since, UAE has been enjoying a VAT-free environment; hence, people do not have an idea on how to deal with it for them to comply to the new laws that have been passed and approved. For this matter, VAT training is a must for every businessman and woman for them to fully understand and grasp the idea of VAT, its effects, and the important things to take note of. Our VAT training will be conducted by our company and will be taught by our highly qualified team member who will explain everything from the related laws of taxes in the UAE to the complexities that come with VAT and things to be done for a balance business that is VAT-compliant. It is advisable for businesses that do not have any accounting department to take care of their VAT affairs to outsource accountants that can handle the VAT side of their business, which we offer as well. For those that do have an accounting department (which you have brought with you in the training), you can go on and apply all that you’ve learned. Lest you need more information or you think you would have further questions in the future, we are always willing to conduct a consultation with you. According to the UAE Tax Law, taxable entities are required to keep records for all supplies and imports of goods and services, tax invoices, tax credit notes, related documents, etc. Businesses are also required to pass requested documents (in Arabic) by the government or Federal Tax Authority, submit tax returns, settle payments. Why is VAT being considered by the UAE? Will imported goods and services be subject to VAT? How will VAT be applied on importation of goods? The UAE government has seen the opportunity to diversify the State’s income sources by not leaning too much on our oil and gas sector. By implementing VAT, the facilities needed by the public will be met even more as it is expected that VAT will bring in big revenue for the country. Goods and services purchased outside the country are subject to VAT. In the event that the recipient of the goods and services in the State is registered for VAT, a reverse charge mechanism will be used with VAT being due on the import. The amount of the importation of goods that includes customs duty will be the value that VAT will be computed on. So the payment for the imported goods cannot be set off against VAT. There is a long list of penalties in the Cabinet Decree Number 40 of 2017 for violations against Tax Procedures Law, Excise Tax Law, and VAT Law. For more information and complete list regarding this, please contact us.